My family loves to eat! We couldn’t wait to get to the Vista dining room on the first night to pick our favorite table at the back of the ship. Menus in hand, we were ready to go. We like to try lots of different things, so we order accordingly and share. If someone doesn’t want to share, then we just order two of that thing. My son thinks this is the most awesome thing. As a teenage boy, he eats more than all of us. And being able to order as much as he wants without worry of the price thrills him. My daughter got the fruit medley with minted low-fat lemon yogurt. YUM! She loves fruit and was very pleased. Next up was the prosciutto ham with cantaloupe and arugula. These are all the appetizers, by the way. I decided to try the salmon-red bell pepper terrine. The pink stuff is horseradish beet aioli which sounded interesting to me. And it was just that…interesting. The last of the appetizers was my son’s frog legs. They were served on a risotto cake with a tomato-garlic concassee. He loves meat of any kind and can now add frog to his list. If I ever see an unusual item on the menu I like to give it a try. This chilled pear, cucumber and melon gazpacho sounded intriguing. The base is pineapple juice flavored with basil, mint and rice wine vinegar. There was also a hint of jalapeno pepper. I enjoyed it…would be great on a hot summer day. Can you guess whose this is? That would be the teenage son who loves meat. He downed this prime rib with green beans, carrots and a potato. My daughter settled on something much lighter with this penne fresca. Both my kids LOVE pasta and always have, so this was a hit. I am always up for a good fish. This was my rainbow trout with pasta and zucchini. I don’t care for fish skin, do you? Tell me in the comments. So it made it a little cumbersome to eat, but it tasted great. I especially liked the capers and tomatoes on the top. What would you order? I went with the lemon torte. I love chocolate, but I also love the refreshing taste of lemon after a meal. And it was so pretty. My son is obsessed with the crumbles that they serve every night. So he went with that. 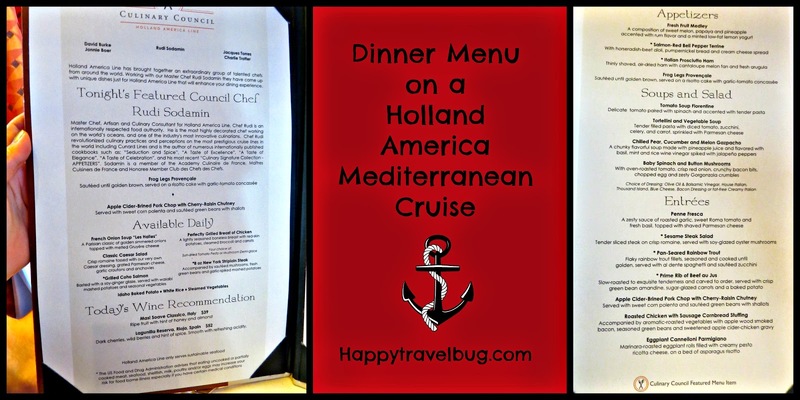 It isn’t listed on the menu, but we have been on enough Holland America Cruises to know about it, so we asked. My husband went with the apple strudel. He loved it. I’m not really a fan of apple strudel in general. But the warm vanilla sauce was delicious. My husband is a chocoholic and since he was sharing his strudel with our daughter, he asked if there was anything real chocolatey hiding in the back. They brought him this chocolate concoction below. It was sugar free and I could tell. He enjoyed it, but said it could have been a stronger dark chocolate taste. Not bad for our first dinner on the ship. Stay tuned for many more dinners to come, including some in port with views like the one below. I seriously took this picture while having seafood in an outdoor cafe for lunch. Heaven! Your vacation eats look crazy good and make me want to take a cruise, like yesterday. Getting a healthy does of vitamin D wouldn't hurt either. That being said, all the delicious food shared isn't a full day of eats, which is the idea behind WIAW. I know Jenn is trying to get this link up back on track and true to the original purpose. As a moderator this week, I'm trying to be a stickler for the rules. I am going to approve this post, but I wanted to let you know for future link ups. I hope you understand and know I am truly trying to be helpful. Enjoy the rest of your cruise, especially all that great food. Wow such beautiful food and so beautifully plated! Love!